Seattle Mariners mascot Mariner Moose performs before the game against the Texas Rangers at Safeco Field, April 27, 2014, in Seattle. Washington Nationals mascot Screech is seen during a Grapefruit League spring training game against the New York Mets at The Ballpark of the Palm Beaches, March 23, 2017, in West Palm Beach, Fla.
Fredbird, mascot of the St. Louis Cardinals, performs during a spring training baseball game against the Atlanta Braves at Roger Dean Stadium, March 11, 2017, in Jupiter, Fla.
Chicago Cubs mascot Clark greets fans before the game against the St. Louis Cardinals at Wrigley Field, Sept. 24, 2014, in Chicago. Minnesota Twins mascot T.C. Bear, Feb. 26, 2017, at Hammond Stadium in Fort Myers, Fla.
Cincinnati Reds mascots Gapper, Rosie Red, Mr. Redlegs and Mr. Red are seen during the game against the Washington Nationals at Great American Ball Park, June 5, 2016, in Cincinnati, Ohio. The Milwaukee Brewers mascot, Bernie Brewer, entertains the crowd during the 2016 Chevrolet All-Star Red Carpet Parade Show prior to the 87th MLB All-Star Game at PETCO Park, July 12, 2016, in San Diego, Calif. The Baltimore Orioles mascot known as The Oriole Bird is on the field before a baseball game against the Arizona Diamondbacks at Oriole Park at Camden Yards, Sept. 23, 2016, in Baltimore. The Phillie Phanatic dances on his ATV prior to the game between the Seattle Mariners and Philadelphia Phillies, Aug. 18, 2014, at Citizens Bank Park in Philadelphia. New York Mets mascot 'Mr. Met' entertains the crowd between innings of a game against the Pittsburgh Pirates at Citi Field, May 27, 2014, in Queens, New York City. 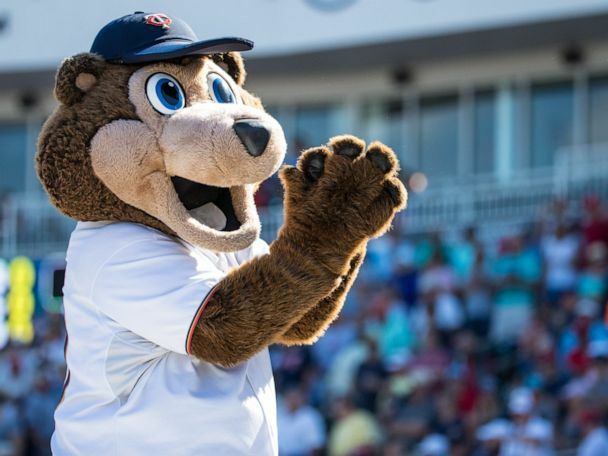 The Boston Red Sox mascot 'Wally the Green Monster' performs prior to the start of the spring training game against the Minnesota Twins at JetBlue Park, March 18, 2015, in Fort Myers, Fla.
Miami Marlins mascot Billy the Marlin before the game against the Philadelphia Phillies at Marlins Park, Sept. 24, 2014, in Miami. Kansas City Royals mascot Sluggerrr is seen during the American League Championship Series Game 4 in 2014. Pittsburgh Pirates mascot the Pirate Parrot performs prior to the game against the St. Louis Cardinals, Aug. 25, 2014, at PNC Park in Pittsburgh. Houston Astros mascot Orbit is seen on the field before the start of the game during the game one of Samurai Japan vs. MLB All Stars at Kyocera Dome Osaka, Nov. 12, 2014, in Osaka, Japan. 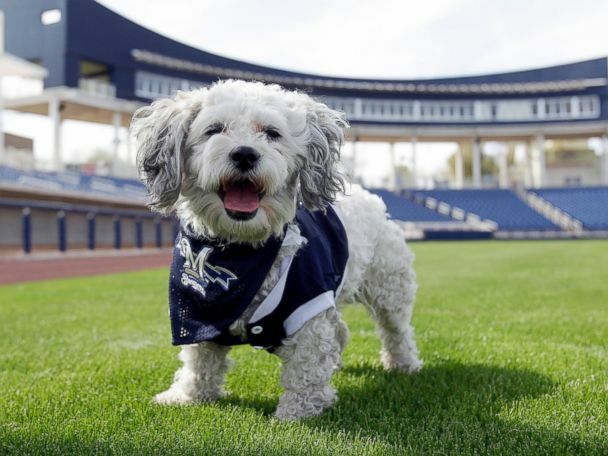 The Brewers baseball team found Hank at spring training and the dog is now their unofficial mascot.